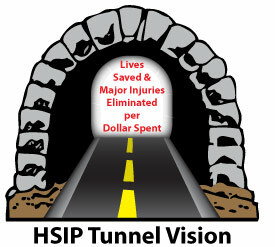 The HSIP mission is to identify and fund highway safety projects that maximize lives saved and injuries eliminated per dollar spent. Under the HSIP, DOT&PF Traffic and Safety personnel annually identify high accident locations on Alaska roads, evaluate corrective measures, fund the most cost-effective ones, and evaluate their effectiveness after projects are completed. There are many competing needs and influences that vie for DOT&PF project funding through other programs. In contrast, HSIP funds are intended to be targeted single-mindedly at life-saving and injury reduction.